By Megan Okonsky Search Engine Optimisation (SEO) Jul 11, 2018 Comments Off on What Can An SEO Agency Do For Your Business? Whether SEO is a new term, or your business is starting to put more of an investment in SEO, you might start to see ads or read news about recruiting an SEO agency. Adding another expense and another set of hands to your marketing team might seem excessive, and what does an SEO agency do, anyway? 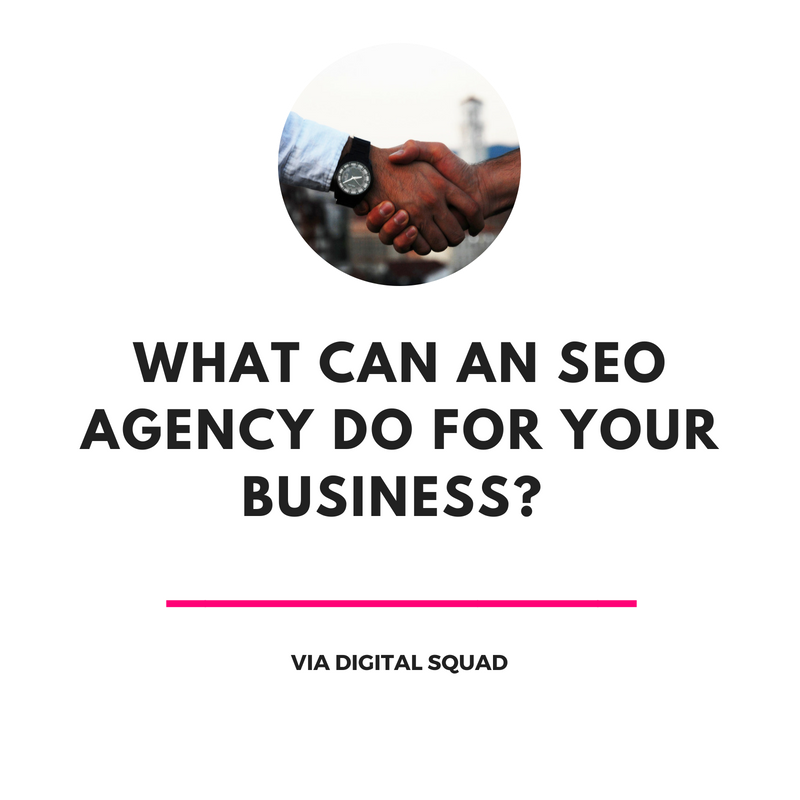 In this post, we’ll break down how useful an SEO agency can be to your SEO strategy, digital strategy, and the growth of your business for your next marketing campaign. As SEO becomes an increasingly popular and effective way to meet your business goals, the help of an SEO agency is becoming more valuable than ever. Search Engine Optimisation (SEO) is the process of optimising your content to appear at the top of search engine results pages (SERPs.) SEO can be applied to websites and landing pages, as well as other online content and even social media platforms. Effective SEO puts your website in front of the online users who are most likely to engage with your content and eventually become a customer of your business. Digital marketers who work with clients across all industries prioritise SEO; 82% of marketers believe that SEO is becoming a more effective digital strategy. It’s the top inbound marketing priority for 61% of marketers. So You Want to Build an SEO Strategy. What Does an SEO Agency Do For Your Business? Well, not exactly. But there are many ways to conduct research about how customers behave online. Data and insights can reveal what keywords are being used by your target audience. These keywords are the cornerstone of building an effective SEO strategy. What an SEO Agency Can Do: Discover those keywords! SEO agencies don’t just want your website to rank for any keywords. Keyword research can reveal what keywords are in the search queries of high-quality leads who are most likely to generate traffic for your website and sales for your business. Once an SEO agency has a group of keywords that they want your content to rank for, it’s time to get started with on-page optimisation, content creation, and other SEO best practices. A site audit is essentially an assessment of your website’s health. Do pages have broken links or need repairs? Is everything up to speed and properly secured? Does each page look right in search results? Site audits help content creators determine what changes are necessary to optimise a website and give it the best chance at ranking for specific keywords. What an SEO Agency Can Do: SEO agencies can perform site audits and interpret the results to businesses. A quick look at audit results can show an SEO expert what issues are most pressing and what can be done to fix them. Before you know it, your SEO agents can fix the issues on your website and monitor how these changes affect the performance of your content. Checking these results is part of an SEO expert’s everyday task list. If there is an issue, they’ll catch it immediately and fix it or give you a ring to let you know what is going on. There is no need to check on the results yourself, and no need to train a member of your team to perform and constantly monitor your website’s health. Google and social media platforms are constantly changing their algorithms to improve user experience and provide the best answers. Updates may cause a change in rankings or traffic that you may not have expected. In order to stay on top of SERPs, you will need someone to learn and understand these updates and direct appropriate changes to how you optimise or create your content. What an SEO Agency Can Do: Leave this task to an SEO agency. SEO experts have already spent months or years researching how Google ranks results, and what updates mean for content creators and businesses who want to consistently rank and drive traffic. Save your team the time and the headache of diving into Google’s algorithm. Are you experts in your field? That’s what Google and Moz want to know. Moz is a software that determines the authority of your website with a domain authority (DA) score. The higher your DA, the higher you will likely rank for keywords. The domain authority score relies heavily on the links you include in your content, and the content that links back to your website. But generating backlinks isn’t just something you have to sit around and wait for; there are many steps that you can take to generate backlinks with your content marketing strategy. What an SEO Agency Can Do: Generating backlinks is a key element of a good SEO strategy. An SEO agency should already have a method for generating backlinks for their clients. Whether their strengths lie in solid content creation, efficient (and ethical) link trading, or distribution channels that reach relevant users, your SEO agency should already know what’s up. If you are interviewing SEO agencies, don’t forget to ask about their link building strategies. An SEO agency’s plan for generating backlinks says a lot about how they conduct business. Do you know how many visitors your website gets? Do you know where these visitors are coming from, what buyer personas they belong to, and whether or not your content is encouraging them to move along the buyer’s journey? There is way to connect each step of the buyer’s journey (and this includes physical purchases) to data that you can track and analyse. The data that is available to you is crucial to understanding how customers make purchase decisions and what efforts you should invest in for your next marketing campaign. What An SEO Agency Can Do: They connect the dots with data. Analytics requires a lot of preparation and coding that can help experts piece together user behaviour. For example, in order to gather the right data to start and analyse a remarketing campaign, businesses have to create and place a piece of code that records when users reach certain milestones online. Once customers reach those milestones, they are sent advertisements and content that remind them to go back to the business’s website. But without the initial knowledge of analytics and placement of code, none of this can be accomplished. Once SEO agencies have all of the pieces of the puzzle connected, they can track and monitor what users are doing online. What is the path that users are taking online and offline? What keywords bring them to your website, and how long do they interact with your marketing materials? What pages are they most likely to leave from? And what marketing materials bring them back for a second or third look? SEO agencies take the work and jargon out of an SEO strategy. They are a partner in building an SEO and overall digital marketing strategy that helps your content reach its potential. If you want to see the exciting results that make companies brag about SEO, it’s time to recruit an SEO agency. We work with partners, not clients. The businesses that we work with aren’t just clients to us. We invest our time and resources into the long-term success of all of our partners. Digital Squad does not work with direct competitors. We deliver results and want to see our partners ranking above their competitors for keywords relevant to their industry and location. Working with two direct competitors would mean someone would have to give up that top spot. We don’t want our partners to be second-best. Our experience and services include more than just SEO. Content marketing and conversion rate optimisation are two strategies that support search engine optimisation. Conversely, SEO best practices must be applied to these strategies in order to get the best results. As a content marketing agency Auckland, we help our partners develop a content strategy that supports SEO. This includes enhancing existing content and planning what content can be created for higher and more keyword rankings. Thinking about dabbling in an SEO campaign or Google Advertising? We’ve got you covered. Our experience also includes Google AdWords Marketing for a handful of partners who have seen revenue spike since we placed their ads online. Knowledge of keyword rankings and on-page optimisation is crucial for a high-ranking and effective AdWords ad. Our SEO knowledge supports us once again when we take on PPC strategies. We deliver results without cutting any corners. In the SEO world, there is “white hat” SEO and “black hat” SEO. Black hat SEO cuts corners and attempts to trick search engines into boosting content even if it doesn’t have any credibility. It’s the “get rich quick” scheme of SEO. White hat SEO is an ethical, honest approach to boosting keyword rankings. Digital Squad prides themselves on using white hat SEO tactics that deliver results. Reach out to our experts at Digital Squad for more information on how you can create an effective strategy with the help of Auckland’s best SEO agency– official winners of the 2019 Semrush Search Awards. As an official Google Partner, we also provide Google Adwords Marketing, Remarketing Strategies and Facebook Marketing.